In competitive rowing events, abbreviations are used for different boat classes. E - 55–59 years of age, and so forth. 1, 2, 4, 8: The number of rowers in the crew. It is common to use Roman numerals, especially when referring to an VIII. If not present then the boat is coxless, except for an eight. (UK) A rower who can row both on stroke side and bow side. The rower closest to the front or bow of a multi-person shell. In coxless boats, often the person who keeps an eye on the water behind him to avoid accidents. (UK) Any sweep rower who rows with the oar on the Bowside (the right or starboard side) of the boat. The oar-less crew-member, usually included, who is responsible for steering and race strategy. The coxswain either sits in the stern or lies in the bows of the boat. The middle rowers in the boat. In an 8-person shell, these are generally seats 5, 6, and 3 and 4 to a lesser degree. They are generally the biggest and strongest rowers. Seat 3 in an 8-person boat, often regarded as having the least responsibility. A rower who weighs more than the restrictions for lightweight rowing. Often referred to as Open weight. A rower whose weight allows him or her to be eligible to compete in lightweight rowing events. Rowers who are rowing for the first season, or (in the UK) a rower who has not won a regatta. (US) A sweep rower who rows with the oar on the port or left side of the boat. A rower who rows with two oars, one in each hand. A rower's position in the boat counting up from the bow. In an eight, the person closest to the bow of the boat is "bow," the next is 2, followed by 3, 4, 5, 6, 7 and finally 8 or "stroke." In certain countries the seats are numbered the opposite way, from stroke up to bow. (US) A sweep rower who rows with the oar on the starboard or right side of the boat. The rower closest to the stern of the boat, responsible for the stroke rate and rhythm. (UK) Any sweep rower who rows with the oar on the Strokeside (the left or port side) of the boat. A rower who rows with one oar (in both hands). A shell with 8 rowers. Along with the single scull, it is traditionally considered to be the blue ribbon event. Always with coxswain because of the size, weight and speed of the boat - bow loader eights exist but are banned from most competitions for safety reasons. A shell with 4 rowers. Coxless fours (4-) are often referred to as straight fours, and are commonly used by lightweight and elite crews and are raced at the Olympics. In club and school rowing, one more frequently sees a coxed four (4+) which is easier to row, and has a coxswain to steer. A shell with 2 rowers. The Coxless pair (2-), often called a straight pair, is a demanding but satisfying boat to master. Coxed pairs (2+) are rarely rowed by most club and school programs. It is no longer an Olympic class event, but it continues to be rowed at the World Rowing Championships. The bow loader coxed pair was nicknamed "the coffin" due to the difficulty for the cox to escape in the event of a capsize. In a sculling boat, each rower has two oars, one on each side of the boat. A shell having 8 rowers with two oars each. Generally a training boat, but raced by juniors in the UK. A shell having 4 rowers with two oars each. Can be coxed (4x+) or coxless (4x-). A shell for three scullers with two oars each, usually without a coxswain. These boats are considerably rare. A shell for two scullers generally without a coxswain. A shell designed for an individual sculler. Very good for skill development, particularly beginners, and a very competitive class at world events, WRC. Extremely rare is the coxed single which is only used as a training boat or for adaptive rowing. A shell with positive flotation, self-bailing capacity, a non-binding stretcher, and no forestay so re-entry is easier. These boats are generally shorter and wider at the waterline than boats designed for flat water racing. The term "Rigging" is used to describe how the boat is outfitted, including all of the apparatuses (oars, outriggers, oarlocks, sliding seats, etcetera) attached to a boat that allow the rower to propel the boat through the water. It is derived from an old Anglo Saxon term wrigan or wrihan, which means "to clothe." It literally means to outfit or clothe a boat. "Rigging" is also used to describe the configuration of the boat and settings of the apparatuses. The following terms are often associated with a boat's rigging, along with other often used terms for equipment used in rowing. The stop mechanism on the seat slides which prevents the rower's seat from falling off the sliding tracks at the back end (towards the boat's bow) of the slide tracks. Also, in the UK, the sliding seat position closest to the boat's bow. As a command, it instructs the crew to adopt this position. (The US calls this seat position the "back end"). The spoon or hatchet shaped end of the oar or sweep. When a coxswain is placed in a seat partially enclosed in the bow of the shell. The front section of a shell. An essential small, soft ball no smaller than 4 cm diameter securely attached to a rowing or sculling boat's bow. Primarily intended for safety but also useful in deciding which boat crossed the finish line first in very close races. A card holding the number assigned to the boat for a race. (UK) Term describing the person stroking the boat has their oar on the Bowside (Starboard or right side) rather than the typical Strokeside of the boat. (UK) The Starboard or right side of a boat. Derives from the tradition of having the bow rower's oar be on the starboard or right side of the boat. A UK term for the clip at the on the top of the bow for holding racing number plates. (UK) Bar across the top of rowlock, secured with a nut, which prevents the oar from coming out of the rowlock. A boat where a pair of oarsmen, usually seats 4 and 5 in the engine room, both row on the same side of the boat. A motorboat used by rowing instructors, coaches or umpires. A thick piece of leather (plastic) around the oar to keep the oar lock from wearing out the wood. A slender pole which is attached to a boat at the Oarlock. One end of the pole, called the "handle," is gripped by the rower, the other end has a "blade," which is placed in the water during the propulsive phase of the stroke. The blade portion of the oar is similar to a razor blade or a piece of paper: Essentially two-dimensional, the third dimension is very thin, although it should be noted that there is a very important element to the third dimension of the blade, namely that it is curved into a sort of hydrofoil, which helps provide much of the thrust. The rectangular lock at the end of the rigger which physically attaches the oar to the boat. 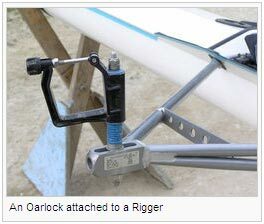 The oarlock also allows the rower to rotate the oar blade between the "square" and "feather" positions. A type of mitten with holes on each end, which allow the rower to grip the oar with bare hands while also warming the hands, used frequently by northern rowers. The name given to that part of the boat to which the skin of the hull is attached. 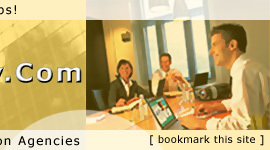 They are typically made of wood, aluminum or composite materials and provide structural integrity. The riggers bolt to the ribs. A "Rigger" is the rowing slang name for an Outrigger. It is a projection from the side (gunwhale) of a racing shell. The oarlock is attached to the far end of the rigger away from the boat. 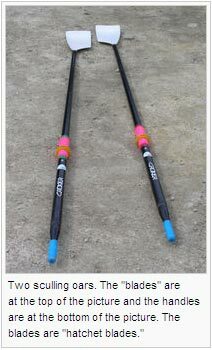 The rigger allows the racing shell to be narrow thereby decreasing drag, while at the same time placing the oarlock at a point that optimize leverage of the oar. There are several styles of riggers, but they are most often a triangle frame, with two points attached to the boat, and the third point being where the oarlock is placed. Rigging is also used to describe whether a boat is stroked by a port or starboard (i.e. port-rigged, starboard-rigged). With sweep rowing, riggers typically alternate sides, though it is not uncommon to see two adjacent seats rigged on the same side of the boat. Often used in the UK to describe an Oarlock, see above. Adjacent to the skeg and used by the coxswain (or in some coxless boats, by a rower using a "toe") to steer the boat via attached cables. Extra-large rudders are used on narrower and/or bendier rivers. (a) An oar made to be used in a sculling boat where each rower has two oars, one per hand (b) A boat (shell) that is propelled using sculling oars, e.g., a "single scull," is a one-person boat where the rower has two oars. Molded seat mounted on wheels, single action or double action. Single action is fixed bearing wheel, double action is wheel on axle that rolls on track and rolls on horns of seat. A secondary meaning of location in the shell, the bow seat is one, and is numbered upward to the stroke seat (8, in an 8 man shell). Thirdly can mean a competitive advantage in a race, to lead a competitor by a seat is to be in front of them by the length of a single rower's section of a shell. Seating positions in a racing shell are generally numbered from the bow to the stern in English-speaking countries, unlike many non-English-speaking countries which count from the Stroke forward. Generally the forwardmost rower is called the "Bow" and the aftmost rower the "Stroke", regardless of the number of rowers in the boat, with all other seats simply being numbered. So for instance the crew of an eight (with coxswain) would number off from the bow: "Bow", "Two", "Three", "Four", "Five", "Six", "Seven", "Stroke", whereas a four (with or without coxswain) or a quad would number off: "Bow", "Two", "Three", "Stroke". Hollow rails upon which a rower or sculler's sliding seat will roll. Older shells might be convex rails with double wheels. A device mounted on the keel of some high-performance shells that determines the boat's speed based on the speed of a small propeller and transmits this information to the coxbox. The space between the gunwales (UK). (UK) The port or left side of the boat (even if the boat is bow rigged). Derives from the tradition of having the stroke rower's oar be on the port or left side of the boat. Term for the rowlock/oarlock. Often referred as gate due to the securing bar/gate at its top. In some boats without a coxswain, a rower may be able to control the rudder and steer the boat by changing the direction his foot points. This is called "toeing a boat." And the mechanism is called a "toe." "(#) Hit it" or "(#) row on"
While carrying the shell, the athletes are commanded to hold the shell in a diagonal position, the high side as stated. (USA) To stop rowing hard. A command by the coxswain, where the rowers all hit the gunnel (sides) of the boat with their oar handles. Used in set exercises occasionally. (USA) Emergency stop, also used after the command way enough. It instructs the rowers to square their blades in the water to stop the boat. Most water commands are appended prior to the command to take place after two strokes. For example "In 2, Power 10" or "In 2, Weigh-enough." A command used when lifting the boat. Grab the boat so that you can lift it over your head. Grab only the gunwale or hull structure - do not lift by the footstop assembly. hands on") : Command given telling the athletes to go to their stations and grab a hold of the boat. To stop rowing after a given piece of on the water rowing length, but to put the handles of the oars either to the gunwales or out in front of the rower, in such a manner that the oar paddles are parallel to the water yet not touching it. This allows the boat to glide for a distance leaving no paddle wake in the water. Similar, but not exactly the same is the command "Gunnel", where rowers push the oars until the handle touches the boat's gunwale. Act of removing the oars from the oar locks and allowing them to float alongside the boat. A command used if the stern is held by a stake boat. "Port scull" usually means Two seat takes Bow's oar in front of him/her and rows lightly with it. 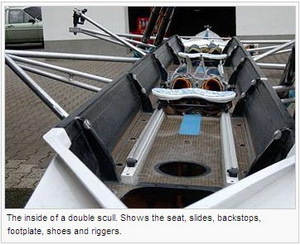 Likewise, "Starboard scull" means Three seat takes Two seat's oar and does the same. This is easier than having one seat take a stroke since it can move the boat in a more parallel direction. "One foot up & out"
(USA) The command to stop what ever the rower is doing, whether it be walking with the boat overhead or rowing. To take a stroke without the blade having been placed in the water, resulting in a complete lack of power. This term is in reference to the water thrown back toward the bow direction by the blade as it enters the water. Less is best. This indicates that the blade has been properly planted before the rower initiates the drive. To propel the shell backwards. Submerge the blade totally in the water. The part of the stroke at which the oar blade enters the water and the drive begins. Rowers conceptualize the oar blade as 'catching' or grabbing hold of the water. Where the blade enters the water. The amount of interruption of the forward movement--usually occurs at the catch and sometimes at the release. The distance between one set of puddles and the next set of puddles. The propulsive portion of the stroke from the time the oar blade enters the water ('catch') until it is removed from the water ('release'). To turn the oar so that its blade is parallel with the water (opposite of square). That portion of the pull-through just as the oar is taken from the water. At the close of the drive phase, the hands move away from the body. The blade is hesitating at the catch point, before entering the water. When two crews share the same shell, during a regatta, sometimes it is necessary for the crews to switch at the finish line without taking the boat from the water. The oarsmen’s hand nearest the oar lock. This is the feathering hand. A problem where the seat becomes derailed from the track while rowing. What the rowers have when they sit with their legs flat and lean towards the bow of the boat with their body. A technical fault where the rower begins the drive before the catch is complete. The hand of a rower that is placed on the end of the oar handle. Fault done by an oarsman when he comes to his full reach forward and then attempts to obtain even greater length by releasing his grasp on the handle with his outside hand or by bringing his outside shoulder further forward. Rowing with a pause between each stroke. The coxswain or rower giving commands will indicate where in the stroke this pause should be taken. The angle between a "squared" blade and a line perpendicular to the water’s surface. Disturbances made by an oar blade pulled through the water. The farther the puddles are pushed past the stern of the boat before each catch, the more “run” the boat is getting. The portion of the stroke from the catch to the finish (when the oar is in the water). This is the propulsive part of the stroke. The non-work phase of the stroke where the rower returns the oar from the release to the catch. At the end of the drive portion of the stroke. It is when the oar blade(s) is removed (or released) from the water. Distance a shell travels during each stroke. The balance of the boat. Affected by handle heights, rowers leaning, and timing, all of which affect the boat's balance, after which the coxswain tells rowers to "set the boat". (see keel). Term used for when an oarsman’s seat moves toward the bow faster than his shoulders. Distance between bowman’s puddle on one stroke and the point at which the No. 7 rower catches water on the next stroke. Amount of time it takes to row 500 meters. Displayed on all ergs and on coxboxes installed on boats with speed coaches (see above). To turn the oar so that its blade is perpendicular to the water (opposite of feather). One complete cycle through the process above. The rower in the stern of a multi-person shell, whose timing is followed by the other rowers. A crew’s 20 strongest strokes, which usually occur in the middle of a race. A feeling in the boat when the rowers are driving and finishing their strokes strongly and getting good layback. Shortened strokes, often used during the start of a race or in a warm-up. When passing a boat, the coxswain announces each seat as it is passed. When an oar blade comes out of the water during drive and creates surface wash that causes the shell to lose power and become unsteady. Actual start: This is generally five or six partial strokes done at a high rate and in a certain pattern, i.e. three-quarter length stroke (sometimes called three-quarters slide), followed by half, half, three-quarters, three-quarters, and then a full length stroke. The goal is to get the rowers off to a cohesive start and quickly build momentum. High Ten: A set of strokes done at a high cadence immediately after the start. Not to be confused with "Power Ten," the high ten is ten strokes at a high rating to finish building speed. Some crews may pull fifteen or twenty high strokes to build even more speed. Settle: Immediately after the rowers complete their high cadence strokes, the stroke tempo is lowered and the stroke lengthened to the rating to be used through out the body of the race. Often accompanied by a Power 10 or 20. Coxswains may call a "Ten to Settle" or "Ten to Glide" to drop the cadence more gradually. The body of the race is carried out at a consistent rating, with power tens called as the coxswain deems necessary. The “second chance” race given to those crews which fail to qualify for the finals from an opening heat. “Rep” qualifiers move onto semi-finals or finals depending on the number of entries. Used in international racing. The last 500 meters of most races are generally at a much higher rating than the rest of the race, as crews pull to exhaustion. In head-to-head races, the coxswain may decide to call a flutter, which is essentially the six-stroke start put into the race close to the end. The flutter may push one boat which is trailing another a few seats ahead, but is extremely demanding on a crew. 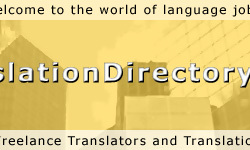 In many cases, it is used as a desperation move when all other options have been exhausted. A long race in which rowers race a twisting course of about 3 miles. A race for time. The start is staggered. Usually in the fall months. In collegiate competition, men's teams sometimes "bet" their shirts on the race, and the loser must render a racing shirt with their logo on it to the winner. Traditionally, this was done as the boats were pulled together right after the race ended and shirts were exchanged, but it is now usually done off the water. Because women's crew is governed by the NCAA, which forbids betting on athletic events, shirt betting is usually only done by men's crews. The term can refer to either the practice or the shirt itself; some crews have shirts made specifically for betting so as to keep their racing jerseys should they lose a race. A race where the crews are drawn randomly from a hat, so that boats are made up of members from different teams and often the lineups include coxswains as rowers and vice versa. Also know as scratch race. A crew which has not rowed with each other before. Rowers 27 (31 - UK) years of age or greater. Competition on unsheltered water exposed to current, tide, wind and requiring navigation skills as well as strength, endurance, and technique. Generally uses a mass start and includes a mix of human-powered boats. Typical race distances are 6 to 26 miles. A method to compare two rowers in fours or eights. Two boats race against each other once. One rower from each boat switch positions, and the two boats race again. 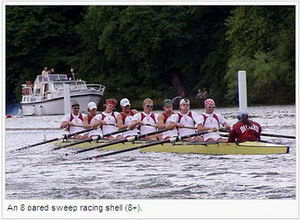 Relative performance in the two races is used to compare the abilities of the two rowers. ^ "Instructions to Competitors:Ball Cup Regatta". Retrieved on 2008-05-02. "All boats must have an Empacher slot. Taping of Race Code and Lane No. on to the side of the boat is a non-starter." 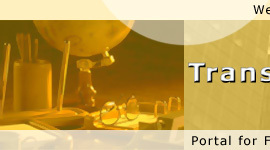 ^ "HEAD OF THE TRENT - CREW INSTRUCTIONS" (DOC). Retrieved on 2008-05-02. "Boats will carry a number, secured in AN EMPACHER SLOT so that the number is clearly visible when rowing."